Just a quick note to say we returned home to the cold yesterday and to thank you for an awesome time. I had a ball. Sitting back and looking at the photos they are bringing back so many great memories. Did you get any photo's off to Ural? 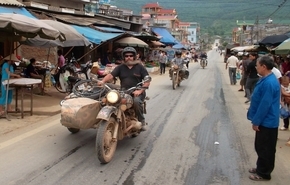 I would love to have a go at the Ho Chi Minh Trail with the Ural and sidecar. Looking at some youtube footage I'd love the challenge.